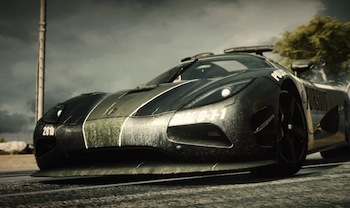 A new studio drives the Need for Speed franchise into the next generation. With everyone trotting out their fancy new computerized home entertainment devices, developers are gearing up their best games for the upcoming holiday showdown. EA's brand new Ghost Games studio has been furiously rubbing Turtle Wax into a fleet of exotic cars as it preps Need for Speed Rivals for release later this year. Equipped with next-gen graphics and the new AllDrive system, Rivals plans to merge singleplayer, co-op, and multiplayer racing in a single open-world experience. Rivals keeps the classic cops vs racers action the franchise is known for and places it in an open world. The entirety of Redview County is yours to explore in your personalized sports car. To help you putt around in the finest of Italian engineering, Rivals will also be the first Need for Speed game in seven years to feature Ferraris. Similar to Most Wanted, you'll be able to play as either a cop or an underground racer, earning points to unlock new cars and customization options as you either overtake opponents or bust criminals. To help you out, there are also 11 upgradable gadgets to equip, from EMPs and shockwaves, to roadblocks and police helicopters. Tieing it all together is the new AllDrive system. As Ghost Game's Marcus Nilsson explains, "the idea with this is that you seamlessly, through player action, go from a single-player experience to [a multiplayer one.]" For example, if you're playing at the same time as a friend, you might find yourselves driving in the same race. Meanwhile, the Autolog system makes a return, meaning you can keep track of all your stats and see how well you stack up to the world. Need for Speed Rivals launches on Xbox 360, Playstation 3, and PC on November 19th, with Xbox One and Playstation 4 versions coming later this year.